Toilet Tracker is a lifestyle management and statistical analysis program for the Google Android operating system. On launching Toilet Tracker you are presented with the main screen which has 3 buttons. ”Pee”, “Poo” and “Pee & Poo”. To use Toilet Tracker correctly you must record your action by pressing only one of these buttons each time you visit the toilet. This allows a track of bodily functions as well as a separate count of toilet visits. When you press one of the buttons you will be presented with a message telling you that your action has been logged. Pressing your menu key while in the main activity will present you with the actions menu. From here you can access Toilet Trackers other features which allow you to view your toilet usage data, publish it through social networking, undo erroneous entries and set up the reminder service. The Stats screen displays a list of statistics in two sections, one for today’s toilet activity and another showing a summary of toilet activity since you started using Toilet Tracker. 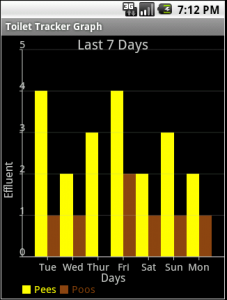 When selecting the Graphs option you are presented with two choices, the first is for a graph showing a summary of the last seven days, and the next shows a graphs for the last twelve months. In each case the graphs plots the total number of pees and poos by day/month. 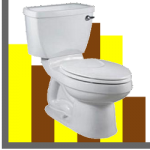 This will help users attempting to increase or decrease their toilet usage over time. It will provide a way to analyse how lifestyle changes affect your frequency of toilet usage. The Facebook menu item allows the user to post a summary of their toilet usage over time to their Facebook wall for others to see. This could be used by a person who has a carer to assist them with toilet usage. In such a scenario the carer would be able to monitor the person’s toilet usage without needing to ask them embarrassing questions. Another scenario would be when toilet training an infant, the Facebook status updates provide a way to inform friends and family about your child’s success in mastering the toilet. The first option in the list allows an update to be automatically sent every time you log a toilet activity. Leaving this deselected Facebook will only be updated when you chose one of the other items from the list to post a summary to your wall. Reminders are perhaps the most useful feature of Toilet Tracker. Reminders can be set for Pees, Poos or both, with a separate interval for each. When you turn on a reminder you will be asked to set an interval. You set this in hours and minutes (HH:MM) and this is the time which your phone will wait after the specified toilet activity before reminding you that you should consider repeating the activity. Reminders are presented as Android notifications in much the same was a receiving a text message. When you receive a reminder you can select it in your status bar to be immediately taken the Toilet Tracker main activity when you can log your next activity. You can also set a Quiet Time for reminders. This is a period during which reminders will be deactivated. If a reminder is due to notify you during a Quiet Time period, then it will wait until the end of Quiet Time before activating. Quiet Time is most useful when a person wants to sleep or enter a period where they do not wish to be disturbed by activity from their phone. To set Quiet Time you must provide a start time and end time for the Quiet Time period. For example if you set Quiet Time up so as not to be disturbed while you sleep you might set the start time for 23:00 (11pm, when you go to bed) and the end time for 07:00 (7am, when you plan to be awake). In the event that you accidentally log a toilet activity erroneously the Undo option allows you to remove the last activity from your logs.